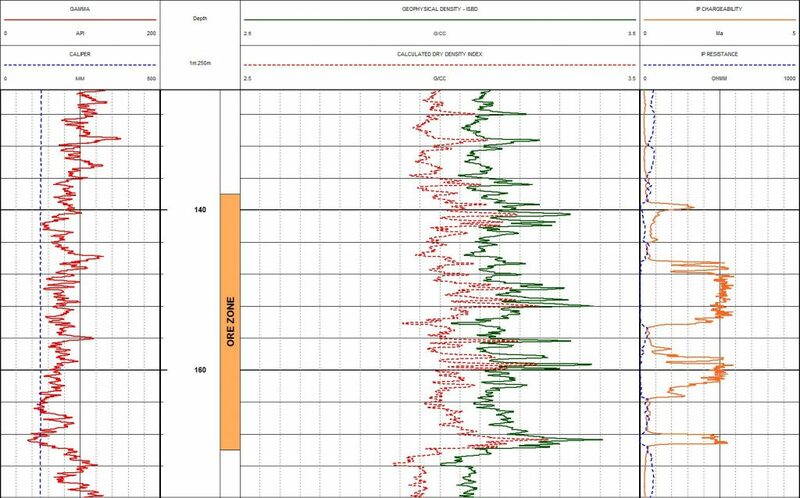 Geophysical borehole density logging in the hard rock mining sector, gold, copper, is becoming increasingly important in mine planning and ore body knowledge. Geological resources are commonly modelled as volumes which need to be converted to mass using density values. Poor bulk density data will result in unreliable tonnage estimates and may impact negatively on mine scheduling, design and reconciliation of mineral production against reserves. Dry bulk density DBD (g/cc) is the density measurement (volume x mass) made from an air dried sample. There is no moisture content factor included. Typically used for mineral processing with the measurement made from core and/or drill cuttings. In situ Bulk Density ISBD (g/cc) is the density measurement which includes the moisture content. Essentially water content within the pore spaces. This is the measurement given by geophysical borehole density logging. Specific Gravity is a density measurement which can be compared to the in situ bulk density as long as the weighing process involved water. The measurement is said to not reflect porosity or water content. An observation of the dry bulk density method and specific gravity method is that both are labour intensive leading to lower sample rates for the data set. Geophysical borehole logging for density is a commonly used, precise technique which generates a large dataset for modelling purposes. Geophysical borehole density logging is a rapid, precise and cost effective method of generating a large bulk density database. Utilising back scattered gamma radiation for a small radioactive source within the geophysical probe, samples every 1cm of logged interval can be generated. Quality control of the density measurements can be achieved by using the caliper data (from the same probe) to identify zones of enlargements or washouts where measurements may be compromised. Dry density values can be generated from a geophysical density data set with knowledge of the porosity and local groundwater density. The example above is from a South Australian copper mine and demonstrates the high sample population generated and the ease of application of the dry density index formula. 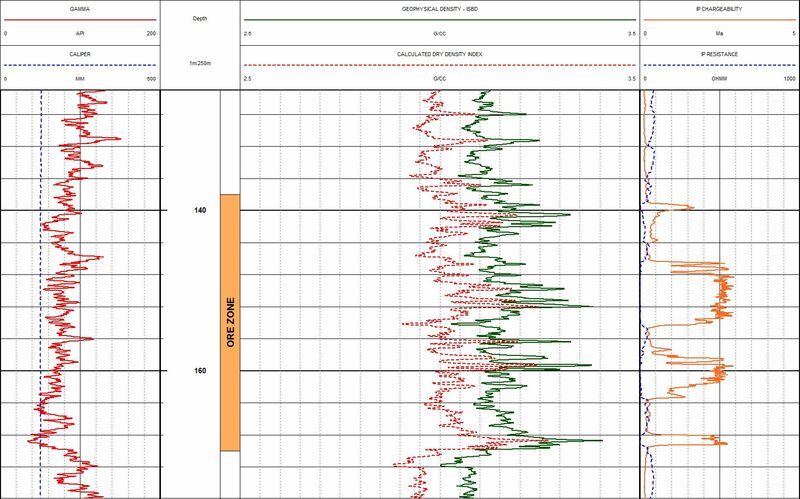 Geophysical Borehole Logging – Geological Intelligence for Ore Body Knowledge.